The prototypical outsider group’s sole album gets the loving curatorial reissue treatment it so richly deserves. 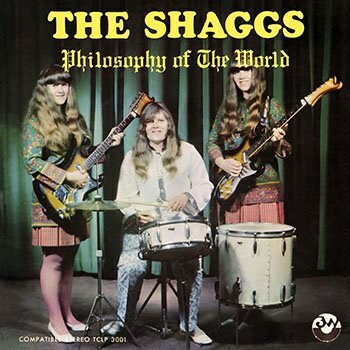 Depending on your perspective, the Shaggs’ Philosophy of the World either represents the very ideal of creative expression and naiveté in its purest form or an unlistenable mess of an album lionized ironically by the underground cognoscenti -- notably hailed by both Frank Zappa and Kurt Cobain -- and at the expense of the performers. And while there are certainly valid points for either side, it is nonetheless one of the more fascinating albums to come from the decade that changed the face of popular music. Often referred to as the holy grail of private press releases, having initially only been released in a run of 1,000, the Shaggs’ Philosophy of the World sounds utterly unlike anything else before or sense. Recorded at Fleetwood Recording studios in Massachusetts in 1968, the album marked the start of what the girls’ father, Austin Wiggin, believed to be the beginning of a major career. Performing their self-penned songs, the Wiggin sisters’ (Dot, Betty, Helen and, later, Rachel) tempos expand and contract, their harmonies are atonal at best, and their guitars could stand to be tuned. And yet these elements coupled together are what makes the album, for many, such an endearing, nakedly honest artistic statement. There are no pretenses here, just three sisters playing their idiosyncratic songs about a whole host of personally relatable subjects. And while the more nonsensical elements -- chiefly “My Pal Foot Foot” -- tend to be the first detractors point to when criticizing the album’s artistic worth, songs like the title track, “Things I Wonder” and “Why Do I Feel?” offer a startlingly deep lyrical insight. Of course many would argue this point to the bitter end, claiming the album to be a worthless exploitation piece, an aural freak show that the hip cognoscenti praise simply because of its sheer weirdness. And while there are certainly those who will come to the album to snicker at the lack of standard musicianship and vocals, those who are able to look past these aesthetic characteristics will find one of the rawest and honest pieces of art delivered from a teenage perspective. It’s a fascinating glimpse into the teenage mind, the Wiggin sisters unabashedly laying their thoughts out plainly and with an earnestness that borders on the heartbreaking. “I often sit and wonder why people do the things they do / And I can’t understand, no I can’t understand why they don’t have faith in the Lord like I do” from “We Have A Savior” is but one of many wide-eyed, emotionally resonant queries posed within the album. While the question itself may be seen as childish, the inherent idealism shows the optimistic nature of the teenage mind that eventually disappears as they become jaded by the world around them, coming to the realization that there isn’t always an answer to these seemingly simple questions. Instead of relying on standard rebellious-teen lyrical tropes, the Shaggs deliver a song praising the efforts and actions of parental figures at a time when most teens would’ve been rebelling against those who brought them into the world. “Parents are the ones who will always understand / Parents are the ones who really care,” they innocently intone on “Who Are Parents". As with nearly every track on the album, the music is shambolic and the vocals somewhat marred by a speech impediment atop an East Coast accent, but the lyrical content helps to raise the album beyond mere novelty status. And yes, “My Pal Foot Foot” may well be one of the more ridiculous, blatantly juvenile songs ever committed to tape -- just try to get through it without laughing at the infantile lyrics and playing -- but it carries with it a light-heartedness that never tries to be anything other than what it is: a nonsense song rooted in childhood imagination and a wide-eyed innocence within which anything is possible. Because of this, there’s an element of twee throughout, tangled up in the shambolic musicianship, that found its way into the sound of early K Records and other, similarly-styled labels and artists. “It’s Halloween” could easily pass for an early Beat Happening song were it not for the sisters’ atonal, unison warbling. The sing-song melody rises and falls as the girls relate all their favorite elements of the titular holiday. From a purely lyrical standpoint, “Why Do I Feel?” is perhaps the group’s most profound offering. When the sisters land on the chorus of “Why do I feel the way I feel? / Why do I feel the things I do?”, it’s a heart-breaking lyrical sentiment that finds them wrangling with a host of confusing emotions. Had it come from anyone else, the song would likely be hailed for its indisputable naive profundity; an existential crisis seen through the simplistic worldview of an idealistic teenager. Yet because it was the Shaggs, many listeners fail to get past the musicianship and get to the very heart of sadness and confusion laid out plainly and with a universality and insight beyond their years. In this, “Why Do I Feel?” could well be the saddest and most tragically real song ever written. So singular is their sound that no one but the Wiggin sisters could ever hope to replicate the sounds contained herein. It’s a testament to its longstanding fascination as a musical curio that the album continues to resonate with audiences nearly 50 years after its initial appearance. And thanks to the crate-digging archivists over at Light in the Attic, Philosophy of the World is once again available to the next generation of disaffected kids looking for a creative outlet for their inner artist. With thorough liner notes from veteran rock scribe and champion of the underground Lenny Kaye, and a host of period ephemera, this new edition -- the first in more than 36 years, following its initial rediscovery and release in 1980 -- is the definitive statement on one of the most polarizing albums of all time. It may not be pretty, but its inherent charm lies in its mere existence. Love it or hate it, Philosophy of the World is a marvel to behold.